MEDICARE MOOP is the most important factor for seniors . MOOP determines how much of your money you must pull from checking, savings and retirement accounts for your health services. We at the SENIOR FAMILY believe MOOP is as seriously, important as you seeing your own Family-PCP, favorite, closest Hospital, and your Specialists. As we focus on MOOP, we are speaking of possible financial risk and your costs. A MOOP statement of RISK by law should be applied to all Medicare Health Plans ! MOOP is always (by: Medicare Law) a cost factor in the Medicare Advantage (Plan-C) Plans. However, the risks apply to: Original Medicare A&B, and/or when combining A&B with a traditional insurance Supplement (Medigap) policy; they have their associated risks that are rarely spoken of. Keep in mind all health plans have their own possible out of pocket risks (OOP), even the Medicare Drug Plan-D has an annual non-fixed risk. THE BOTTOM LINE is how much do/could you have to pay from your wallet or pocket-book! Remember: A Medigap-Supplement is a traditional insurance product. 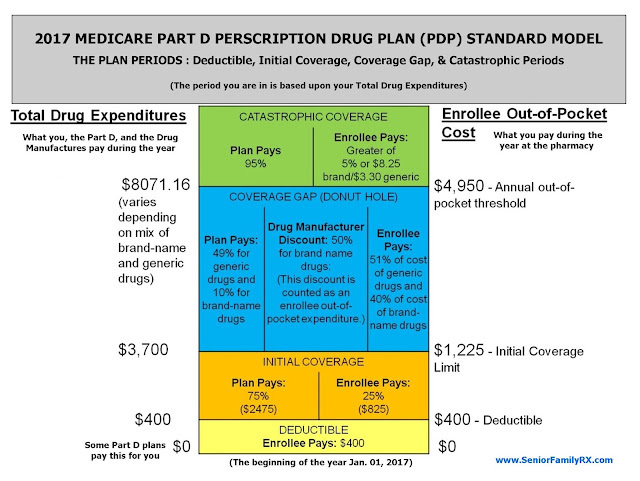 The Advantage Part-C and Drug Plan Part-D's are Medicare Approved Provider plans. A Medicare C Advantage Plan is never considered or referred to as a Medigap or Supplement. PLEASE, ALWAYS KNOW YOUR MOOP & RISK! For any other plan types please call or write. IRMAA HITS THE PLAN-D's!!! 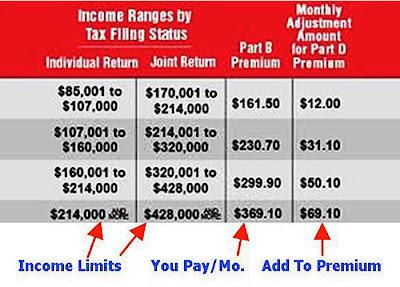 STARTING JAN. 2011, A NEW EXTRA COST FOR PART-D DRUG PLANs if your income is greater than $85,000-S-IND or $170,000-J-MARRIED TAX FILERS. IRMAA CAN EFFECT YOUR PART B, C, and D COSTS. Part D-Income Related Monthly Adjustment Amount per the §3308 of the Affordable Care Act amended §1860D-13(a)(7) of the Social Security Act by the National Healthcare Reform Act of 03/2010. Commonly referred to as "Obama-Care", PPACA, or sometimes the Affordable Care Act. In a "nutshell", It's a new cost that will be deducted from/out your SS check/deposit for your Medicare PDP or Plan-D. The IRMAA deduction effects single/indiv. filers whose income is greater than $85,000 and married/joint-filers if your income is greater than $170,000. The IRMAA payment is $12.00 per individual and then escalates to as high as $69.10 if your income is greater than $214,000-indiv/$428,000-joint annually. MEDICARE WILL MAIL AN IRMAA LETTER INFORMING YOU OF THE ADJUSTMENT BASED UPON INFORMATION IT RECEIVES FROM YOUR FRIENDS AT THE IRS. SOMETIMES YOU CAN APPEAL A MEDICARE IRMAA ADJUSTMENT. 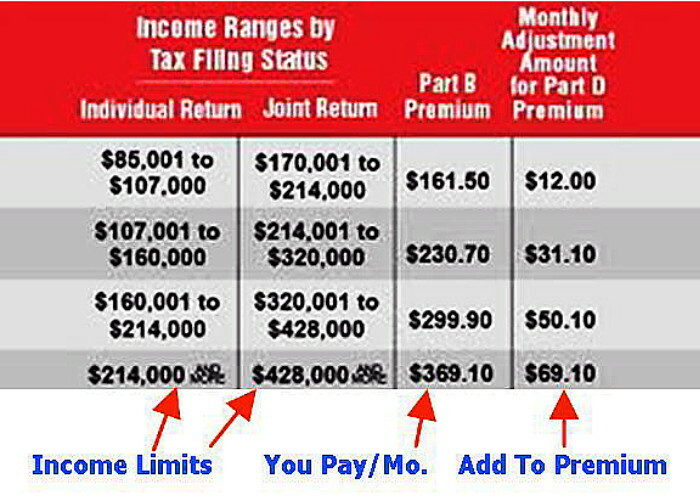 http://www.ssa.gov/online/ssa-44.pdf *Note: In this link the adjustments are all additive to current premiums..
SS.gov/IRS definition: Modified Adjusted Gross Income (MAGI): Simply put, is your AGI plus your TAX FREE income added back in. (obviously, not related to Christmas). The Senior Family has only been trained with tax principles, concepts, and thresholds, always consult with a CPA and (or) qualified TAX ADVISOR. Comments, Questions, and Advice below or call tollfree 855-SENIOR6. YOU ARE NOT ALONE, MOST FAMILIES SPENT THEIR EARNINGS ON THEIR HOMES, THE KID'S & COLLEGE, & RETIREMENT SAVINGS. 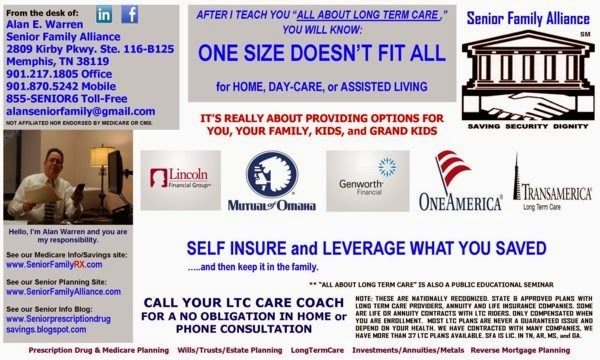 now you can leverage your accomplishments for your 70% risk of senior care. The Newer Approach: Asset-based long term care coverage, simply speaking, is an old traditional insurance policy with a long-term care rider attached. It's an alternative to traditional long-term care that offers the opportunity to multiply your investment dollars to cover long-term care and other late-in-life medical expenses. These are an effective, secure strategy for planning for medical care down the road. These eliminate the concern of throwing away money on an policy that may go unused. That's right, it's a hybrid product offering that is a safe and no-risk. 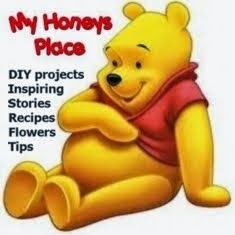 It's always available to you & your family. It can also be used as a retirement income vehicle if the LTC features are not needed. It's for Savings, your Estate, Nursing Home, it's for Assisted Living, Home Care, or Day Care ...some contracts even can cover both spouses at once. If it's never used for you care the un-used principal and cash value can even be passed to the policy holder's spouse and heirs or to build your estate for the kids and grands. Very simply: Asset-based long-term care policies work by leveraging existing assets to help pay for the financial risks of long-term care expenses only if they are needed, otherwise they are passed to the family. They offer tax benefits and have simple estate planning benefits. The cash value and your principal can always be borrowed from or spent in case of any emergency. *Please aware, This type of LTC is only meant stay on par with inflation and guaranteed investments. The death and multiplied healthcare benefits are non-taxable. This is the last-to-use protective investment a client should own and use, it is a near end of life, health risk management. and estate financial tool. 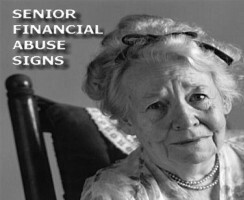 *For your protection: The Senior Family only represents or recommends AAA, AA, A Standard-Poor's rated companies. 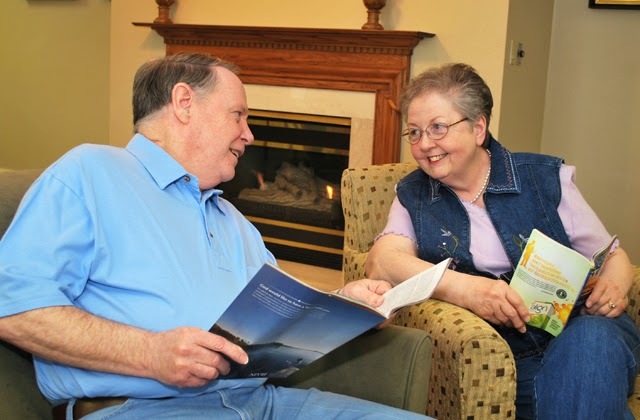 Request a copy of the National Association of Insurance Commissioners, LTC Buying Booklet, "A Shopper's Guide to Long-Term Care Insurance." ** Hypothetical illustration, products vary in interest rates and compounding methodology. 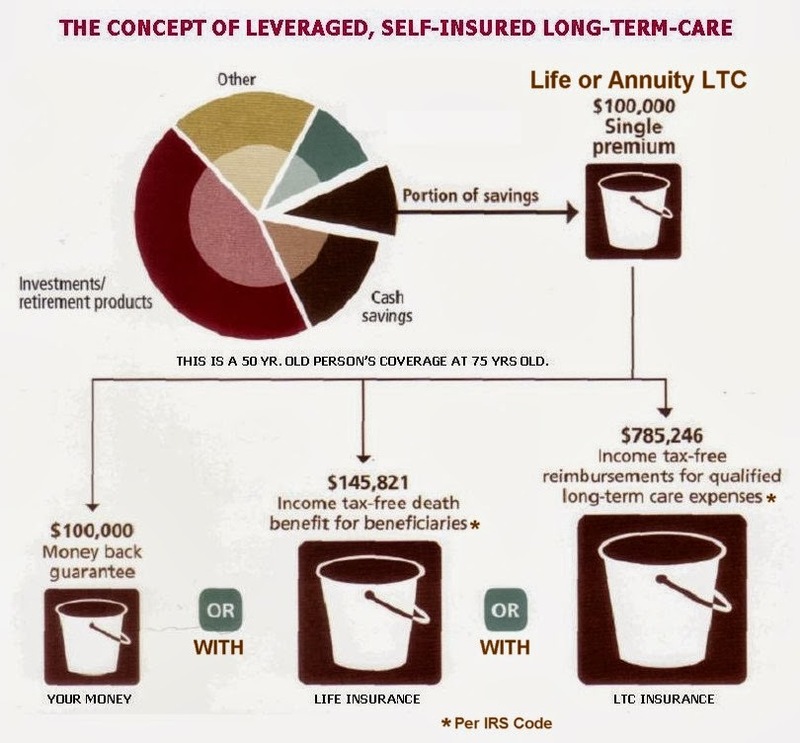 LTC products vary in the coverage amounts. This is only a conceptual diagram. The $100,000 is only an example, typical minimums are $50,000. Death benefits and LTC benefits are reduced by withdrawals and loans. **By Medicare Definition: "Excess charge is the amount a doctor or other health care provider is legally permitted to charge a higher than the Medicare-approved amount, the difference is called the excess charge." If something goes wrong or the doctor feels there was extra work he may charge extra. You are responsible for the Part B extra-excess amount. The excess amount can be 15% greater than approved Medicare average cost and that excess must justified, then approved. These charges can occur in the hospital, as an out-patient, or in the doctor's office. THE F-TYPE IS SAFEST & G-TYPE A VERY CLOSE 2ND. My clients, Mr. & Mrs. C, both having their F-type Medigap supplements with me, have experienced a more than 40% increase in monthly premium costs. Mr. C's F-plan, alone, went up a whopping $34 dollars. I then called the carrier, going to a manager level person to check the prices, it was correct they said. In September, Mrs. C's plan will also increase, so the Mr. & Mrs. C family could possibly see a $55-$70 dollars monthly increase (a lot less groceries/a tank of gas). The reality is that as CMS/Medicare cuts payments to their doctors, the doctors will correspondingly react with healthcare price increases, thus raising their service fees, This is the pattern of insurance premium costs. But there is some relief with you assuming more fees and some extra risk. Plan M uses the Part A deductible cost-sharing as a method to keep your monthly premiums lower. What this means is that, in exchange for slightly lower monthly premiums, those on M would split the Medicare Part A deductible ($1184 in 2013) with the insurance company 50/50. The insurance company pays half, and you pay the other half of $592.00. 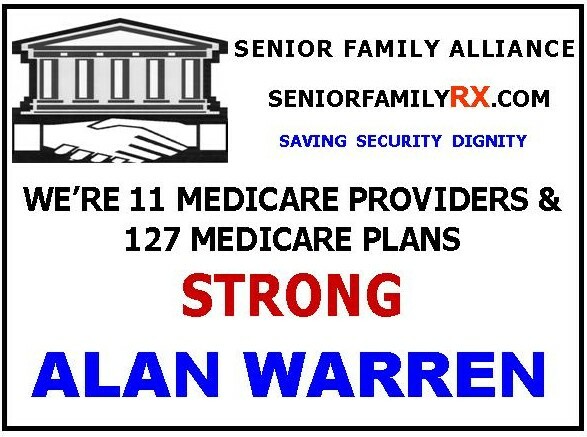 Plan M does not cover the Medicare Part B deductible of $147.00. Most these plan's premiums to be around 15% lower than the popular F premiums. NOTE: Careful consideration to your number of annual hospital visits is needed. 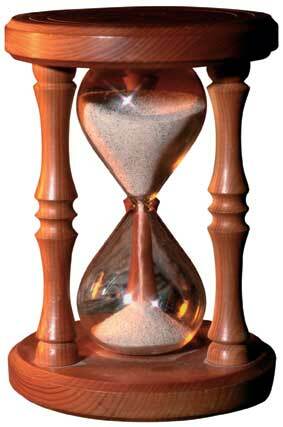 The Medicare Part A deductible period is 60 days....there are 5 periods each year. Plan N uses Part B cost-sharing as a method to reduce your monthly premiums. 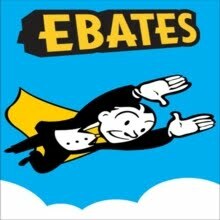 However, rather than use the deductible-sharing method you must pay the Plan B deductible and doctor visit co-pays to help reduce the premium costs. The system of co-pays is set at $20 for doctor's visits ($50 for emergency room). You must pay your annual Medicare Part B deductible of $147 in 2013. This plan should provide 30% lower premiums than the popular Medigap Plan F premiums. NOTE: Careful consideration to your number of annual doctor visits is needed. WHERE TO GO: Through SeniorFamilyRX.com's alliance with Medicare.com you can compare Plans M and N and all of the Medicare Supplement plans. We are a national resource and can answer any questions about the new coverage options and provide customized rate quote comparisons for your age and zip code area. 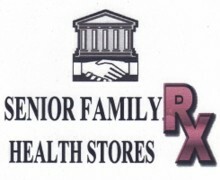 The quote comparison tool is at the link "SHOP MEDICARE PLANS" at www.SeniorFamilyRX.com. 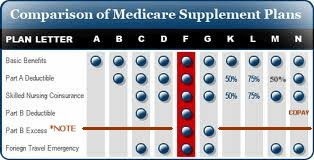 WE 1st RECOMMEND THE MEDIGAP SUPPLEMENTS PLAN TYPES F AND G BECAUSE THEY OFFER THE HIGHEST LEVELS OF COVERAGE, THEY BOTH COVER "MEDICARE EXCESS CHARGES." The only difference between the F & G is the payment of the annual Part B deductible which is $185. (2019). Always and Only ask a qualified Medicare Advisor about healthcare risks. 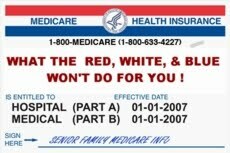 ALERT: IF YOU WERE BORN AFTER 12/31/1954 AND MEDICARE START DATE IS ON/AFTER 01/01/2020, THE SUPPLEMENT TYPE "F" IS NO LONGER OFFERED. 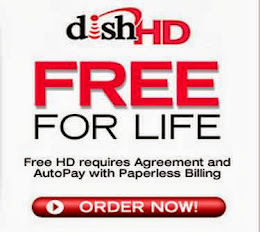 For those without internet access please call: Us at 901-217-1805 for a personalized consultation. We can help to determine your "break-even" point between your Type F plan and these new plans. Feel free to call or simply comment a question here. HELP I've lost my Plan C, it's not offered anymore!! Advice for a Medicare Advantage C Plan TERMINATION. The plan terminations can be initiated by Medicare (CMS), State Insurance Departments, or the Plan Provider company. Each year, private Medicare insurance plans and CMS evaluate their ability to effectively provide Medicare insurance. As the Medicare rules change from time to time, private Medicare insurance companies have to make decisions about whether to continue to offer the same insurance plans or terminate plans. Private Medicare Provider plan carriers can simply made the decision to terminate their Medicare Advantage plan for business profitability reasons. The plans have a year to year contract, so the terminations are on Jan 1st thus allowing a member to switch during the usual AEP. Because of a plan closing any other time of year, you will need to enroll in a new plan during your enrollment special election period (SEP). If your plan has been unexpectedly shut-down, Medicare will assign you a SEP to enable you re-enroll in a new Advantage Plan or go-back to your Medicare A & B, buy a Med-Sup (Supplement), and enroll in a Part D. Your goal is to enroll in similar plan-type coverage with the ability to see the same physicians, specialist, go to the same hospitals, and get the same medications. When enrolled in a Medicare Advantage plan that has been cancelled for next year or any time, the member will receive information in the mail from his or her Medicare insurance carrier with instructions regarding his or her options. 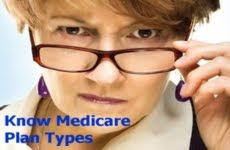 Generally, the Original Medicare plan A&B with a Medigap Supplement with a Part D or another company's Medicare Advantage C plan may provide the Medicare member with the closest experience to the lost plan. The plan member is not required to remain with the same carrier if his or her plan was cancelled. The member may select a plan offered by the same insurance carrier or pick a new plan from a different insurance carrier in the area. The most careful considerations to the new plan's Details of Coverage and Summary of Benefits is needed. TYPICALLY, WHAT TO REMEMBER : PLAN THE PROVIDER MUST NOTIFY YOU, THEN YOU ARE GIVEN A SPECIAL ELECTION PERIOD (SEP). YOUR SEP CHANGE PERIOD IS 2 MONTHS BEFORE AND ENDS 1 MONTH AFTER YOUR PLAN'S CONTRACT ENDS. IT'S BEST TO HAVE A NEW PLAN COVERAGE DATE EFFECTIVE THE SAME DATE AS YOUR PREVIOUS PLAN'S CLOSING. SO HAVE YOUR NEW PLAN ALREADY SIGNED AND IN PLACE PRIOR TO THE OLD PLAN CLOSING. IF I AM YOUNGER THAN 59 1/2 AND RETIRING NOW, WHAT DO I DO ABOUT DRUGS and INSURANCE? 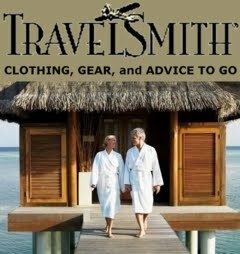 You need a financial planner to advise you.... You need a company plan or some health insurance plan coverage to protect you until you reach 65. Before going to Medicare you must have some type of coverage. One sickness or an accident can wipe out your entire retirement savings nest-egg. Many early-outer retirees face this insurance and drug plan problem. If you have the money to be able to retire early, so you better be protecting it! Seniors now have to make their money last much longer..because we live longer. Seniors now have to plan retirement money to last 30 or more years. One sickness or an accident can wipe out your entire retirement savings nest-egg that you must be able to rely upon for many years. You must be covered to manage that risk of loss; for you, your family, heirs and your legacy. A qualified financial planner will help you sort out your options for covering that risk and managing that risk at a reasonable monthly cost. It is now possible for you and a health care provider to split that cost! Understand Part-D drug TIERS, cost levels, then SAVE..
Doctors sometimes are quick to recommend the newest thing on the market, well generally the "newest" is the most expensive. On most Medicare Part-D drug lists (formularies or covered drugs) the newer brand-name drugs are the highest tier=highest priced drugs. It's not likely your physician will know the Tier system of your Part-D provider. It's impossible for him to have the data/lists from all the D providers. Each D provider has different drugs listed in each tier. It's up to you know and understand your own Plan-D, know it's Tier system and co-pays/co-insurance costs, and especially its formulary (covered drug list). Where your prescriptions are on the list (by tier) determine how much you pay and when/if you go to the "Donut". Ask your Medicare advisor about your plan's tier levels, specific drugs you take, what tier, how much? 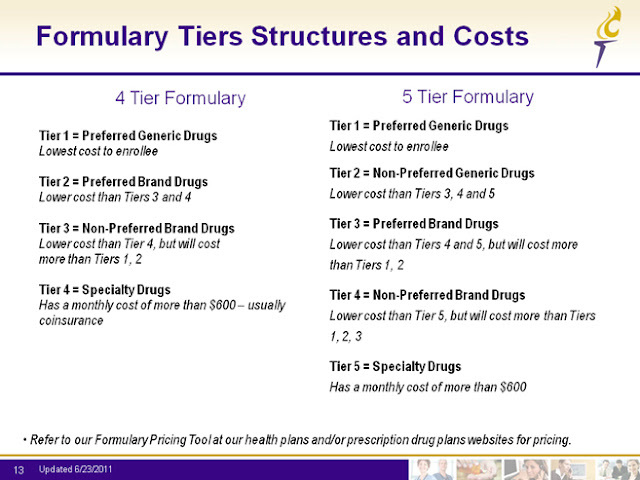 Your plan's Drug Formulary List with have your drug's tier cost level. Then know your pharmacy's retail price for the drug. The co-pays are fixed dollar amounts, however the last top tier levels are a percentage co-insurance amount of retail costs. Simple multiply the percent times the retail cost. Example....$400 retail cost at 35% co-insurance cost is $140 dollars you will pay. Copay amounts are fixed, known prices and the co-insurance amounts are non-fixed prices, many times an unpleasant surprise. THE TIERS 1 and 2 ARE THE LOWEST PRICES on the four-tier type. THE TIERS 1, 2, and 3 ARE THE LOWEST PRICES on the five-tier type, thus offering greater numbers of fixed-payment, copay drugs. Sometimes you must coach your doctor and ask about prescribing generics and lower tier drugs that are less costly. REMEMBER: IT'S WHAT YOU AND YOUR PLAN-D PAY TOGETHER EACH YEAR THAT DETERMINES WHEN YOU REACH THE DONUT, for 2019 the amount is $3820, then "...you're in the Donut"! We consistently use MEDICARE.GOV plan finder for Part D. You should too! We add a clients drugs, pharmacy, and provider plan, then it tells us costs and Donut information. It even shows the monthly costs! Medicare Prescription Drug Plan (PDP or Part D) coverage is insurance that covers prescription drugs outside of a doctor office or hospital stay, not covered by Parts A or B. The Part D is primarily for retail and mail-order pharmacy purchases. 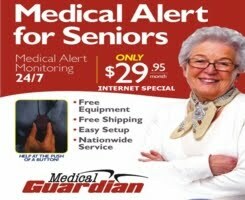 The plans are run by Medicare approved insurance companies or other Medicare Provider companies. Each plan can vary in cost and drugs covered. but all plans must meet basic Medicare standards model for drugs covered. Medicare prescription drug coverage provides cost risk protection for people who have very high drug costs and from unexpected prescription drug bills. The Part D Plan's model cost sharing averages are about 75/25 with co-pays still ranging from $0 to $50 and co-insurance co-pays ranging 30% to 70%. The higher priced Plans give people the lower co-pays and co-insurance and immediate, no-deductible coverage. The low-costs plans you have pay the deductible before you are covered. Per Medicare rules, you can change plans any year during ANNUAL ENROLLMENT PERIOD (AEP) Oct. 15 to Dec. 7. Plan changes can also be made during a qualified SPECIAL ELECTION PERIODS (SEP). REMEMBER: Co-pays are lower, fixed prices and Co-insurance are not fixed costs..
All Part D's have their 4 periods: (1) The Deductible Period, (2) The Initial Coverage Period, (3) the non-Coverage Gap (Donut) Period, and (4) the Catastrophic Coverage Period. There are only 2 ways to get Medicare Part D coverage: With a stand-alone Medicare Part D Plan or within a Medicare Advantage Plan (MAPD) that has the Part D built-in the plan. Keep in mind, all Plan D's re-set their coverage amounts renewing each new year on Jan. 1st. REMEMBER: NEVER FOOL YOURSELF INTO THINKING YOU DON'T NEED A PLAN-D BECAUSE YOU ONLY USE THOSE $3-$4 GENERICS. POSSIBLY, AT SOMETIME YOU WILL NEED A "BRAND NAME" OR SPECIALTY DRUG. THE FINANCIAL RISK COULD BE VERY HIGH. THERE ARE MONTHLY MEDICARE PENALTIES FOR NOT HAVING A PDP 63 DAYS AFTER YOUR ENROLLMENT PERIOD. GOOD NEWS: THERE ARE QUALITY, AFFORDABLE PLANS FOR THOSE WHO ARE EVEN ON A "McDONALD's" BUDGET. In prior years to 2011, a Plan D member was totally responsible for all costs during the "donut." Again in 2019, pharmaceutical manufacturers will be required to provide qualified beneficiaries who reach the Part D Donut Hole with discounted prices of 63% & 36% of the Part D plan sponsor's negotiated price for brand name drugs and for generic drugs. 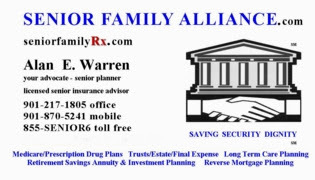 The discounts are to be applied before other prescription drug coverage under another health plan but after any supplemental benefits provided by the drug plan sponsor. The discounts must be made available to the member at the pharmacy check-out, and the costs paid by drug manufacturers toward the negotiated price must count toward a beneficiary's total out-of-pocket threshold. For 2019 you'll pay 36% for brand-name drugs and 63% for generic drugs during your DONUT-HOLE. These are based upon Medicare average cost and retail pharmacy price. The standard benefit for Part D plans, As the chart below indicates, The annual deductible for 2017 is $415. There will be an increase in the Initial Coverage Limit (ICL) for 2017 is $3820. The deducible $415, initial limit $3820, non-coverage limit $4950, and catastrophe amounts are governed by Medicare for the Drug Provider companies to standardize their plans. The are CMS/Medicare Part D established plan models. When you and your Part D provider spend to the $3820 threshold, this is a very important number.......IT'S WHEN YOUR NON-COVERAGE, "DONUT-HOLE" BEGINS!!!!! For 2017, to get out of your non-coverage, donut-hole period you must have total-purchased, out-of-pocket amount of $5100 to regain your coverage. This $5100 is the summation of what you the member and pharmaceutical companies pays during the donut-hole periods and what you spent during initial coverage period..
Once you pay $5100 through your Donut-hole, you go into the Catastrophic Coverage Period where your cost are very minimal, $3.30 for Generics and $8.25 or 5% for Brand-name drugs (the higher/greater of). Medicare Standard Plan limits, periods, thresholds, and standard benefits are established by Medicare/CMS, NOT BY A COMPANY or PLAN PROVIDER, however your Part D Provider can better the standard Medicare model. During the "DONUT" non-coverage period medications purchased with a discount card or purchased from non-US pharmacy DON'T count toward getting your coverage re-established to the Catastrophic Coverage Period. These purchases, depending the time of year and drug costs can prolong your non-coverage period. Prescription medications purchased outside the United States is against the law per FDA rules. Never use these methods unless you are certain there no chance of the regaining of your coverage prior to the Dec 31 annual reset of your Part-D. A drug discount card or the buying relationship with foreign pharmacy is never a substitute for a creditable MEDICARE PART D PLAN. 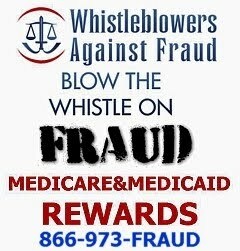 Remember, going 63 days without a Medicare Plan D can cause a lifetime penalty! Oh, we carry and we're appointed with 5 nationally recognized, approved Medicare Part D Plan providers..